We manufacture all types of field coils and shunt coils for DC motors & generators, from 1 HP to 30,000 HP, and weighing 1 lb. to 2000 lbs. Shunt, Series, Stabilized Shunt, or Compound Wound. we have the experience & equipment to manufacture most any coil design in existence. 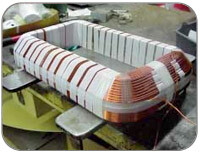 We also manufacture interpole coils with a multitude of sizes, shapes, & designs, including edge-wound coils. We are your one-stop shop for 1 coil or 10,000 motor field coils. 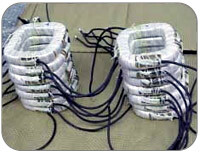 Shunt wound field coils, characterized by a high turns count and relatively fine round (or rectangular) wire size, require special manufacturing techniques, such as precise placement of each turn. 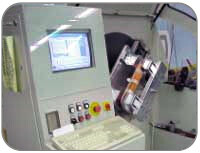 This process is termed layer-winding, and our people are highly skilled at it. Whether by means of hand winding, or by use of our computer controlled winding equipment, we can meet your exact requirements, for one coil, or several thousand coils. © 2011 Stimple & Ward Company.